Riding a bike gives kids a way to explore and enjoy the world outdoors. But what’s the best way to teach a kid to ride a bike. It’s tricky business, right? Training wheels, scraped knees, and all that running along side holding the seat? Several years back we met some friends at a park in Gloucester, Massachusetts, to watch a cyclo-cross race. A good time with friends, watching our two girls play together for the first time. Anyhow, that was the first time I ever saw a kid riding a ????? 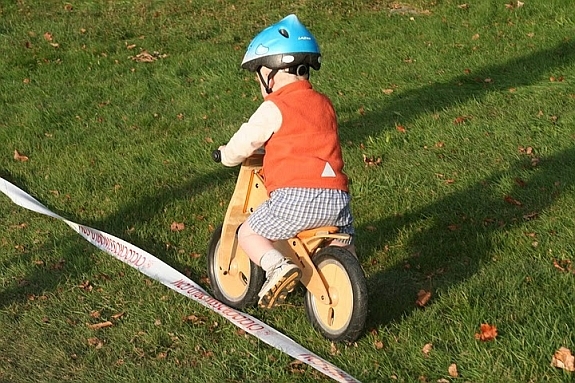 Skuut wooden balance bike. It was a revelation. There was this kid, couldn’t have been any older than my two-year-old?in fact, he could have been younger?and he was riding a bike. This bike had no pedals, and the seat was set low enough that he would alternate between walking, scooting himself along, and coasting. As he came to the top of a rise, he’d lift his feet and ride all the way to the bottom. The idea is nothing less than cheap nfl jerseys genius. The bike teaches kids to ride by teaching the balance part first, in a way that allows them to learn it gradually, at their own pace. At the time, Skuut was cheap jerseys China the only company making these, and they were pricey. Since then a lot of companies have tossed their bikes out wholesale jerseys China onto the market, and the price cheap jerseys has come down (on the Skutts, too). Many have gone beyond the simple look of wood and come out with metal-framed bikes. Today, our daughter is riding a wooden balance bike from Smart Gear, and it’s turning out just as we planned. In the past year we’ve had to raise the seat, and she’s become really adept as cruising. Watching her ride up and down the driveway, you can almost see her looking for new ways Walks to move the wheels forward. The transition to a bike with pedals will be no problem later this summer, and we’ll have a kid riding a bike before she turns five. Now if there was just an easy way to teach swimming, whistling, and how to blow a bubble. . .